This plant commonly goes by two names in Ayurveda: gokshura in Sanskrit, and gokhru in Hindi. Tribulus terrestris is the Latin name. The word, gokshura, comes from two Sanskrit words: go (cow) and akshura (hoof). This is because the small fruits (about 150 mg each) look very much like the hooves of cows, with several big thorns and lots of little spines on them. The Hindi name, gokhru also means “cow’s hoof,” and Vaidya Mishra uses both the Sanskrit and Hindi names interchangeably in his ingredients. Some modern studies have found that gokshura increases testosterone. According to the Sanskrit texts , gokshura has the property of being balakrit (giving physical and sexual stamina). It is not a vajikarana herb (aphrodisiac), like ashwagandha. It supports overall physical, as well as sexual, strength by building all the tissues, especially shukra dhatu (reproductive tissue). The term in Ayurveda used to describe any herb or food that builds all the tissues is bringhana. Bringhana comes from the Sanskrit word, brihat (big or great) because it helps you to gain weight. 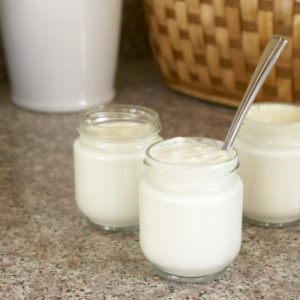 Milk, mangos and dates, for example, are all bringhana foods. They are helpful for gaining healthy weight because they nourish all of the seven dhatus (tissues) classified by Ayurveda: rasa (plasma), rakta (blood), mamsa (muscle), meda (fat), asthi (bone), majja (bone marrow and nerves), shukra (reproductive tissue). When someone has a depletion of all the dhatus (tissues), they usually become very thin and weak. Tuberculosis is the ultimate example of wasting (kashaya). Bringhana herbs and foods help to fill out the depleted tissues and restore strength. Not only is gokshura a bringhana herb, it is also a vrishya herb. Vrishya means that the quantity, and more importantly quality, of shukra dhatu (reproductive fluid) is improved. Gokshura works directly on the shukra dhatu to strengthen and purify it. Gokshura especially nourishes the subtlest fraction of shukra dhatu, the sukshma bhag of shukra, which is the raw material for ojas. Ojas is the semi-vibrational material which connects the soul and the body, and gives strength to the whole body. In this way, gokshura not only supports shukra dhatu but, by doing so, strengthens the whole body by indirectly increasing ojas. Gokshura has madura rasa (sweet taste) and madura vipak (pro-alkaline post-digestive effect) and sheetala virya (cooling thermogenic property). All of these factors indicate that gokshura has a lot of soma (nature’s cooling, nurturing vibration). 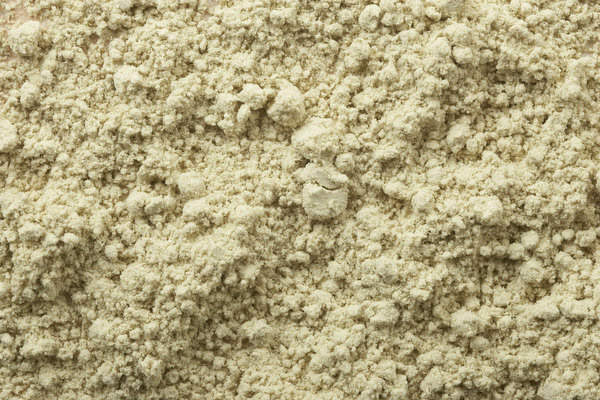 Surprisingly, gokshura also is a dipana herb, which means that it increases the digestive and metabolic flames (agnis). This is a fairly unusual and fortunate combination. The balanced amount of both agni and soma in gokshura explains why it helps to nourish the whole system, and is called pushtidas (highly nourishing) by Bhava Prakash. Soma is nourishing, but soma without agni is useless. This is seen in the case of people with high pitta/ low agni. They have a great need for soma to cool the pitta and nourish the body, but because of low agni (weak digestion and metabolism) they often end up eating like birds. They simply cannot digest or metabolize the heavy, nourishing foods that they really need. That’s how the dhatus become and remain emaciated. The way to fix this problem is to give both soma and agni in balanced combination. The dipani (agni-enhancing quality) built-into gokshura allows the soma of the plant and other food to get fully utilized. It gets transformed into healthy tissues instead of becoming ama (partially digested material). Gokshura builds all of the tissues because it has enough soma to reach even to the subtlest tissue, shukra, and because it has enough agni to stimulate all of the dhatu agnis in the chain of transformation between rasa and shukra. It’s a perfect combination for building up the tissues. That’s why gokshura is a bringhana herb (nourishing all seven dhatus). Another feature of this common herb (even called a weed by some), is its ability to clean the bladder and genitourinary tract. The term in Sanskrit is bastishodhana. Basti means urinary bladder, and it also refers to the whole genitourinary tract. Gokshura helps remove physical toxins like amavisha (reactive toxins) from the bladder, the prostate and other organs, according to the ancient texts. And it also helps to remove vibrational toxins from these organs. Like physical toxins, vibrational toxins must also be removed from the body. For example, electromagnetic toxins, and even the highly acidic old toxins from the liver, have a “buzzy,” vibrational energy of corrupted prana that must make its way out. If those vibrational toxins get stuck in the bladder or genitourinary tract, then they can constrict the channels there and create discomfort and other problems. Vata is most easily affected by vibrational toxins, which is why the Sanskrit texts say that gokshura is vatanut (removing vata imbalance). Gokshura removes the vibrational toxins from the bladder and genitourinary area and allows apana vata (the downward flow of prana in the body) to flow normally. The combination of vibrational and physical detoxification of the genitourinary tract is what makes gokshura helpful for ashmarihara (preventing kidney stones), according to Bhava Prakash. It cannot break kidney stones. Allopathic medicine is expert in removing stones, but after extracting the stones, gokshura can be used to help reverse the tendency to form more stones. Of course, gokshura will not work if you are not following proper diet. If you are are taking gokshura to keep the genitourinary channels clean and open, and you are eating tomatoes, potatoes, bell peppers and eggplant, which shrink the nadis (vibrational channels), and acidify the shrotas (physical channels), this herb will simply not work. Bhava Prakash says that gokshura is krichahridaroganut (helpful in the case of moderately difficult heart problems). It is not Ayurveda’s main herb for the heart. Arjuna holds that spot, but as a supporting herb, gokshura is very helpful. How does it help? It supports the heart by indirectly improving ojas production. The heart needs a lot of ojas, and gokshura helps to produce it. Gokshura does not increase ojas directly, but it strengthens all of the dhatu agnis (each of which contribute to ojas production). It also increases the quantity and quality of the sukshma bhag of shukra dhatu (the subtle fraction of reproductive tissue which is the raw material for ojas). In this way, gokshura indirectly helps to make more ojas available in the body. When there is a lot of ojas in the body, the heart is strong. Another way that gokshura supports the heart is by supporting the genitourinary tract as we saw above. When you are detoxifying the heart, it is important that the acidic toxins removed from the coronary artery do not get stuck in the kidneys or bladder. You may be taking care of the kidneys with punarnava, but the bladder needs support from gokshura. Otherwise, the acidic toxins from the heart (or liver) can cause a bladder infection, and can even be reabsorbed into the bloodstream from the bladder. According to Bhava Prakash, gokshura is also useful in the case of prameha (useful substances coming out of the urine as in the case of diabetes), swas (breathing problems), kas (chronic cough) and arsha (hemorrhoids). It is also a diuretic, as we have already seen. 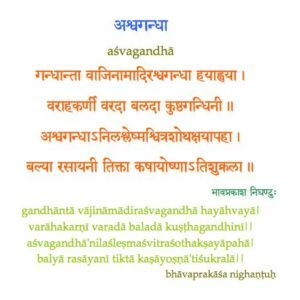 In this 25 minute audio lecture, you will learn directly from the Sanskrit text, Bhava Prakash, about gokshura. 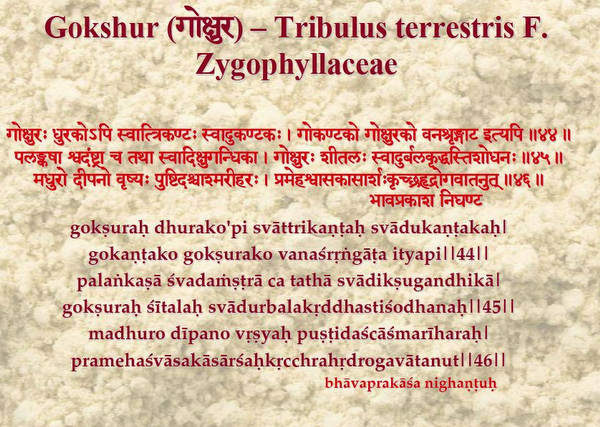 The text, which Vaidya Mishra translates and explains word for word, gives many descriptive names for gokshura, as well a list of physical properties and prabhavas (special properties). 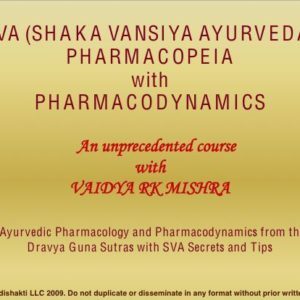 You will benefit from Vaidya Mishra’s family knowledge of Ayurveda as you listen to his understanding of this valuable plant. You will gain an understanding of the three main classifications of disease in Ayurveda. You will even learn a diuretic recipe, with gokshura, at the end of the lecture. When you download the zip file for this section of the course (and unzip it using a free unzip program like 7-Zip), you will find a PDF file (which can be opened with the free Adobe Reader) and an MP3 file (which can be played on any MP3 player such as iPod or iTunes). You can listen to the audio alone, but for the first time through (at least), we recommend that you follow along with the PDF document to make sure that all of the concepts are clear. The PDF’s sometimes contain visual diagrams in addition to the Sanskrit verses. If you learn visually, reading along with the PDF will be helpful. We also recommend reviewing the PDF, and re-listening to the MP3 file many times, so that you begin to recognize the knowledge and own it. These MP3 files are especially good to put on your MP3 player so you can listen in the car. Just as it is easy to remember songs you hear over and over on the radio, you will find that the knowledge in these lectures will stick to you with no effort when you hear them over and over. You will also find that your understanding of the material deepens each time you hear them. Contains only the essence of the herb with its subtle vibration. Bypasses the digestive system, which may be weak, and gently nourishes the sukshma bhag (subtle fraction) of all the dhatus, especially shukra dhatu. Should be added to 1 to 2 liters of cool, neutral pH water and sipped throughout the day. 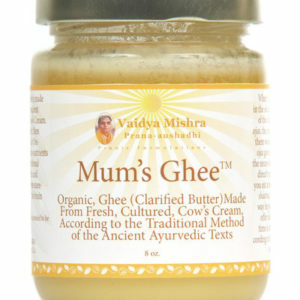 Contains the full nourishing and detoxifying ability of the gokshura. Requires more digestive strength than the Gokshura Herbal Memory Nectar. Should be combined with other herbs for a more balanced and effective treatment. Check with your Shaka Vansya Practitioner before using. This product and statements have not been evaluated by the FDA (Food and Drug Administration) and are not intended to be used to diagnose, treat or cure any disease. All of the information above is intended for educational purposes only and may not be used to replace or complement medical advice.